While tramping around the United States in a motor home, Lois and I developed comedy/drama sketches that played well in churches, camps and conferences. 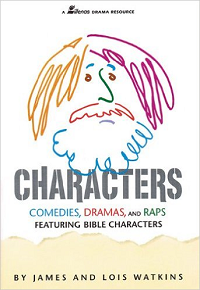 In 1993, Lillenas contracted us to publish our favorites in the book, Characters. Now that Lillenas has rung down the final curtain as a publisher, we’re now making a few of our very favorite sketches available on a donation basis. Simply send what you think it’s worth—please no rotting produce—to the address below and enjoy. What might happen if a “prosperity gospel” TV evangelist tried to interview one of the original disciples who had “no silver or gold”? The smooth-talking public relations director of Jacobus and and Jacobus wants John the Baptist to “soften” his message to reach a wider, most tolerant audience. What would have been the reaction of this stargazer’s wife when this “wise man” returned after two years with an outrageous story about a star, dreams and a virgin giving birth to a king? The governor of Imperial Rome over Judea struggles with how he dealt with Jesus and is now confronted with rumors that he is alive.